CWNA | CCIE or Null! Study Notes page is up! I’ve added a new page to the blog, Study Notes. In this section I will be posting the notes I take while studying for different topics. Now my notes are usually pretty rough and right to the point I take the notes in evernote so I can read them anywhere. Currently I have my CWNA Security Objective notes there, next up will by notes for the Site Surveying Objective. I’m hoping to tackle one CWNA objective a week. My thoughts on the CWTS exam from CWNP. Last week I went ahead and took the CWTS (Certified Wireless Technical Specialist) exam from the CWNP group, now I know they consider this almost a “sales” certification but I wanted to start with this exam just to see how the CWNP group present their exams compared to Cisco, Microsoft, RIM, and CompTIA. Well I managed to pass the exam with a 90% (70% is the minimum score required to pass) so I did fairly well on the exam. I did think a few of the questions were not worded in the best way, but it appears I understood what they were asking for. My primary sources of study was the Official CWTS study guide from CWNP, along with their practice exams hosted off the CWNP website, not to mention a few years of supporting multiple wireless networks. Now I’m not usually one to say “yea get the official study guide you’ll be ok with that” but in this situation I have to recommend the official study guide. It does an amazing job at covering the CWTS exam objectives. Plus I found it a very easy book to read there plenty of clear concise explanations with enough images that promote the text (Images also span between some of major WLAN equipment vendors Cisco, Proxim, Motorola, etc). The only downside I found concerns the material on the CD that is included with the book. While it does come with sample tests and flash cards I found a few of the questions to be incorrect, another reason to purchase the online practice tests. Now the material on this exam are the fundamental basics of a WLAN (pertaining to the 802.11 standards, the RF spectrum, and WLAN hardware) and because of that I really do recommend this to any type IT professional who is new to working with WLANs. Whether you are help desk/field technician or even a network administrator that needs to support/implement a new WLAN this book does deserve at least one look over. When I first started working with WLANs I would have loved to have this book it would have saved me hours of research back then. 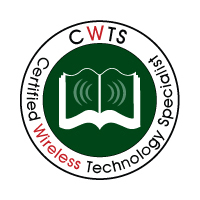 However if you are like me and you have plenty of experience with wireless already I would skip the CWTS and go straight for the CWNA certification. Now that’s a rap for the CWTS, considering my experience with this exam and the material, I will be pursuing my CWNA certification later on this year but I want to squeeze in a lot of study time for the CCDA exam before Cisco retires the 640-863 April 30th. It’s a certification I tried pursuing a long time ago but just never dedicated that much time to, however between then and now I’ve read many Cisco design guides and both 640-863 Cisco Press books. So if you notice my upcoming entries leaning more towards network design consideration that’s why.